In a Midwestern town that really gets into its Christmas celebration; complete with decorations, a big parade and dozens of Santa Clauses, one Santa has gone rouge. Armed with knives, a scythe, and even a flamethrower, he sets out to punish the naughty and reward the nice. Sheriff Cooper (Malcolm McDowell) and Deputy Bradimore (Jamie King) are the only people that stand between the killer Santa and the rest of the town, but they are pursuing the wrong man. 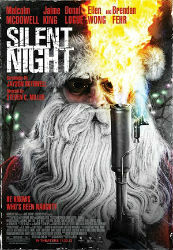 Silent Night is a very loose remake of the original ‘Silent Night, Deadly Night’ (1984) keeping only the general concept and the most iconic kill from the original (also kudos for the ‘Silent Night, Deadly Night 2’ (1987) shout out, I nearly spit up my drink when it happened.) It wastes no time getting to the Santa mayhem, with evil Santa suiting up and going after his first victim as the opening credits roll. The plot isn't original at all but works well enough to not be tedious. It does try to introduce a red herring, but you know it’s not the killer, and it feels like the movie is wasting time when it could be getting back to Santa Claus and his flamethrower. Malcolm McDowell is a great actor but he’s not terribly convincing as a tough talking small town sheriff. Jamie King is actually very good as the conflicted Deputy. The kills are gruesome and occasionally inventive, and the color palette is suitably Christmas themed, especially the final confrontation which sees a police station drenched in red and green emergency lighting. I don't know if it will reach cult status but it's a fine addition to the Christmas slasher sub-genre. Seems like an interesting horror film. Will definitely catch it on DVD. I was surprised at good it was in a sub-genre known for usually being pretty terrible.